← This is my story, this is my song. Last Monday, October 3rd, I woke up around 5:15 in the morning and began to make my way to the hospital. No, I was not experiencing an emergency – I was scheduled for surgery that morning. You see, in the past year I turned my right ankle three times. Once last May working on a show at the theatre, once in August carrying my laundry (which was actually the worst injury, methinks), and once this June working on another show (exactly a week after I got engaged). This last time around I decided to visit an orthopedic doctor and get an MRI done, just to check things out. It wasn’t doing to hot, and I was getting tired of not being able to run or even walk well. It turns out that I had torn a ligament, and was told that I would need to have surgery to replace it. Immediately I was very anxious. I have never had surgery of that sort before. I had my wisdom teeth taken out, but that was not as invasive. I also had a very busy month coming up in September: A trip to New Jersey to visit my fiance’s family, a show to stage manage, my birthday, a retreat weekend for engaged couples, and my confirmation on the 30th. So, I decided to schedule the surgery for the first part of October, hoping that I would not injure my ankle further during all of my busyness. I made it through the busy month of September unscathed, and October was here. Once I was finally in the hospital, I felt very calm. I knew that I had reached the point of no return, and that worrying would get me nowhere. My fiance and his father (who is also my priest) were with me, and I knew many people who were praying for me. The surgery went very well; no complications whatsoever. In fact, once my ankle was opened the doctor noticed I just needed two ligaments repaired, so he did not have to use a cadaver ligament to replace mine. And now here I am, sitting around the house convalescing. While doing so, I started thinking about the idea of surgery. It hurts. It hurts much more than I think I could explain. Doctors like to ask about your pain on a 1-10 scale. That Monday night at 2:00 am I woke up in excruciating pain. The pain block they had given me before the surgery had worn off, and it seems the medication they prescribed me was not working. I would say my pain was at a 10 for the rest of the night. I kept taking my pain medication as prescribed, but it was no help. The pain level stayed in the 9-10-11 range for most of the day on Tuesday until the doctor prescribed a more powerful medication. I took that around 1:30 pm and waited for it to kick in. Count that up: Pretty much 12 hours of the worst physical pain I think I have ever experienced. It was highly unpleasant. While going through this, and later as I contemplated it, I was struck by the fact that surgery is technically injury. While it was done in a hospital under the careful observation of medical staff, the bottom line is that my ankle was cut open and a part of me was moved around and poked. My body was technically going through trauma. Trauma to heal. It seems like an oxymoron. I recognize that this is the way life is. In July I did a painting. I used different shades of reds and browns, and black. The feeling I had was one of pain, of suffering. I like to paint. I do not consider myself an artist, really. 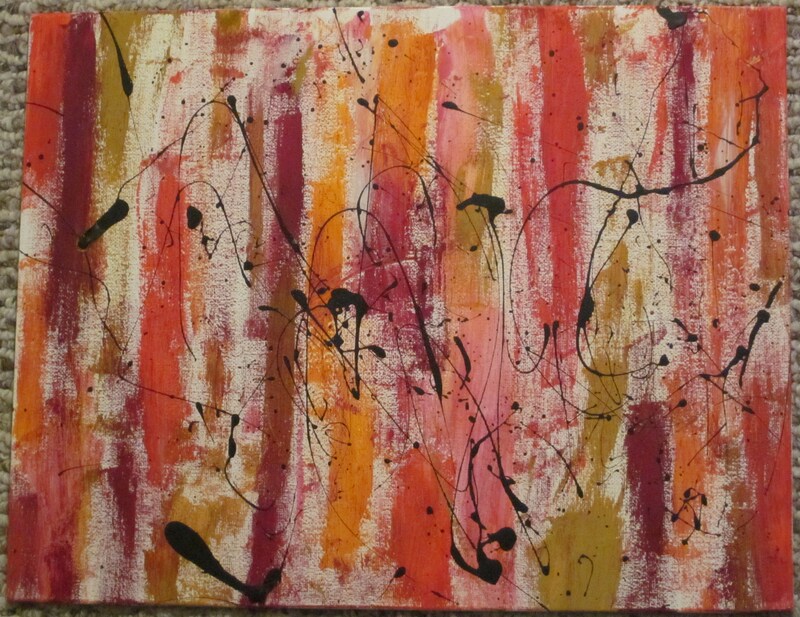 I am just the artistic type who loves the cathartic nature of flinging some paint onto a canvas. In the end, I did feel better. I felt a sense of suffering being useful. The title of that painting is the same as the title of this post: “Dolor me cura”. In English this translates to “Pain heals me”. This is shown quite physically through my surgery. The surgery itself was a form of pain. The PT will be difficult; trying to bear weight and learn to walk again will be a form of suffering. And yet I will come out stronger on the other end. I can think of many times in my life where my discomfort was great. Grief and pain have been at the 11 level at times. And yet, through my suffering I was learning. Growing. Healing. Pain/grief/suffering/hard times/sadness – it cures me. It heals me. It strengthens me. It is so disheartening and terrible while you are experiencing it. In the end, I truly believe that it will heal and help you. Thanks be to God.